A CSA in Queens, NYC. Founded in 2013. White Potatoes – 2 1/2 lb. 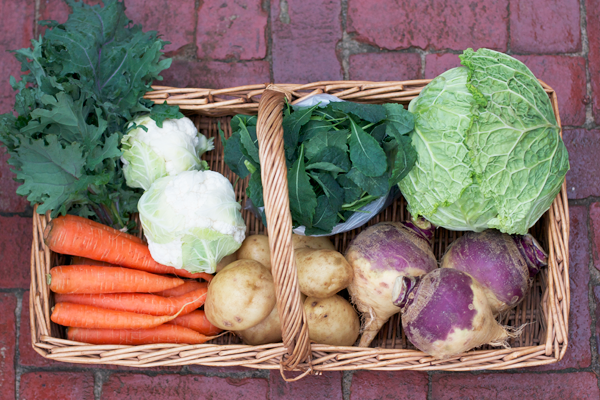 Just two more weeks of the CSA season! A lot of our “winter” roots are coming in now, including the rutabagas you’re getting this week. Rutabagas are wonderful, especially when mashed like potatoes. They will store well if you want to save them for your Thanksgiving table. Everyone is getting at least 4 pounds this week. Are you one of the lucky members getting a single rutabaga that tops 4 lbs all by itself? They’re the size of our heads! What else is coming in this week? Cauliflower – Our fall favorite! You’ll get one or two heads, depending on the size. You can easily steam the florets, or try this week’s recipe. Baby Salad Kale – Harvested when small and tender, these kale leaves are perfect for raw salads. Savoy Cabbage – A wonderful ruffle-leafed cabbage variety. Light enough for slicing thinly in a salad or coleslaw or try this week’s recipe and saute with garlic & ginger. White Potatoes- Light and fluffy when mashed. Save these for Thanksgiving if you wish. Just be sure to keep them in a dark place! Carrots – A full 2 pounds for everyone! These are great roasted. It brings out their super sweet flavor. Kale or Bok Choi round out the share. Perfect steamed or sauteed. Pickup on Tuesday at ALEWIFE, from 5pm – 7pm. All CSA members get a 10% discount on drinks at Alewife throughout the season! Please remember to bring sturdy bags to carry your produce home.